I love it when those food videos appear in my Facebook newsfeed. I drool my way through most of them knowing they are far too complicated, fussy or calorie filled for me to ever make them. Then come those that offer great possibilities like this one. Most get copied into a blog to be made at a later date, but every once an awhile they end up on my table within 24 hours. My wonderful friend and publisher Julie Salisbury of Influence Publishing was returning from almost 6 months abroad travelling in Mexico, Britain, Southern France and Malta. She was arriving mid-afternoon after a long plane trip, so I knew she would be tired and hungry. I wanted a simple supper that was ready to go so that I could spend whatever time she stayed awake enjoying talking to her and hearing about her travels. The first video to catch my eye was a recipe for Huli Huli Chicken. It had a wonderful marinade and you just dumped everything in a Ziploc the night before, then finish on the grill. It was served with grilled pineapple spears. Perfect! No muss no fuss in the kitchen. You can check out that recipe HERE. I threw together this bean salad in the morning minus the avocado. While I picked my friend up at the airport, my husband grilled the pineapple and chicken and placed it in a low oven to keep warm. 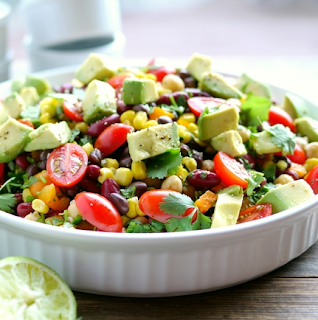 Then right before serving I cut up the avocado, tossed it with a little extra lime juice and gently added it to the bean salad. 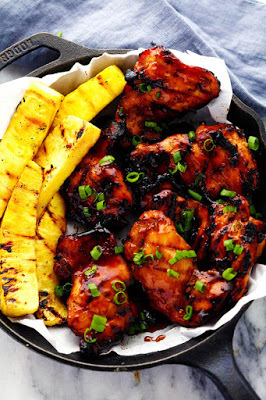 The chicken is wonderful, but the grilled pineapple served with it took it to the next level. Then the salad was a great counterpoint. Not highly dressed - just olive oil, lime, salt pepper - but it let the chicken's flavour take centre stage. And I'm going to throw some cooked turkey in the leftover bean salad to make a healthy lunch today, so cook once eat twice. Works for me. NOTE - I also added about 3/4 C shredded carrots for some extra colour and crunch! I love including more veggies. And, when I made this again will be adding some green onion as I felt it needed it. Note - My change was to hold the avocado out until the last minute, toss it with a little extra fresh lime juice and then gently mix it in.